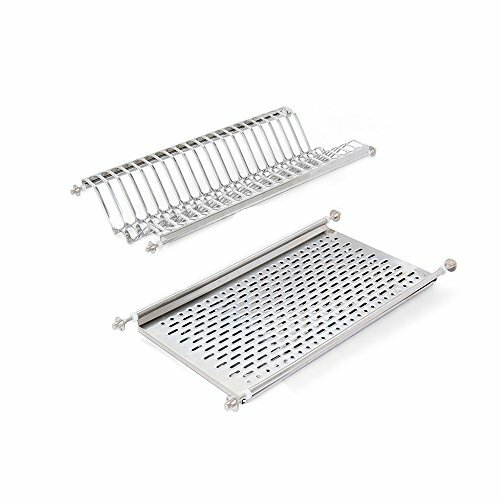 Two-tier dish drying rack with dropsholder tray completely made of stainless steel (racks for plates and glasses made of stainless steel AISI 430 and dropsholder made of stainless steel AISI 304). Improves and optimizes the storage of plates and glasses on kitchen cupboards. Easy installation and strong fastening: assembly with 8 lateral tensioners that tighten trays to the cabinet. Universal size, so can be installed in any 60cm-width kitchen cabinet. Supply includes: 1 rack for dishes, 1 rack for glasses y 1 dropsholder tray. Racks for plates and glasses made of stainless steel AISI 430 and dropsholder tray made of stainless steel AISI 304. Universal: to be installed in an standard 60cm-width kitchen cubboard. Easy installation and strong fastening: assembly with 8 lateral tensioners that tighten trays to the cabinet. Supply includes: 1 rack for dishes, 1 rack for glasses y 1 dropsholder tray. If you have any questions about this product by Emuca, contact us by completing and submitting the form below. If you are looking for a specif part number, please include it with your message.